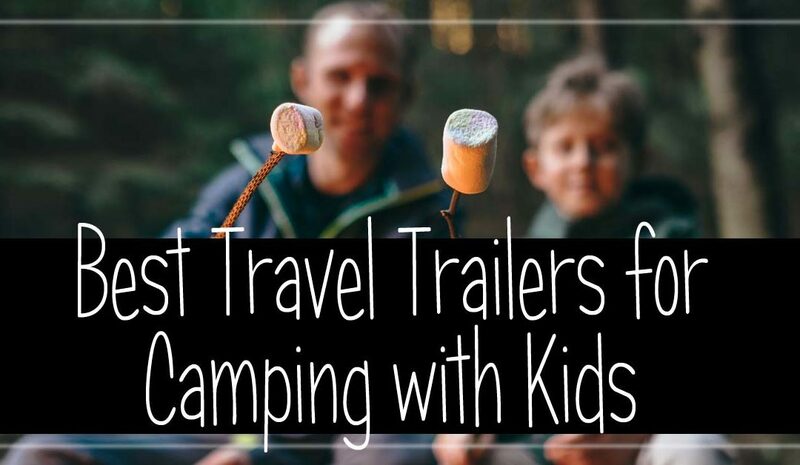 The best travel trailers for camping with kids will be the one that accommodates your family’s needs and meets your camping goals. What type of camping do you and your family prefer? Do you have a bucket list of places you want to see? Or would you just prefer to set up camp at the beach as often as possible? Whatever your ambitions to enjoy the great outdoors, the best travel trailer for you is the one that makes you and your family feel comfortable. It should feel like your home away from home and include some amenities that make life on the road just a little more enjoyable. If you plan on spending a week, a summer, or a lifetime in your RV selecting the right size and fit could make all the difference. Which type of travel trailer is best for you? The size of the travel trailer or fifth wheel will be determined by the size truck you have to tow it. Travel trailers have a great advantage because they are slightly larger than fifth wheels and they are easier to haul and hitch. You will need to know what your weight limit is for the truck you own. Here’s a good guide that will give you the weight limit of your truck. One bathroom or one-and-a-half? It depends on what’s going to be most comfortable for you and your family. Do you have small children or teenagers? A one-and-a-half bath is ideal for so many reasons. It doesn’t take up a lot of room and the kids get to have a bathroom just for them! Another great feature Zinger travel trailers offer is an outside shower with hot and cold running water. A great feature for camping at the beach! How important is the kitchen? Isn’t that where everyone likes to hang out after a long day of play? Well, what about having two kitchens? Want to have some friends over for dinner and watch a movie outside? Many of the Crossroad RV Zingers feature an outdoor kitchen with storage and a small refrigerator. Inside, there is lots of storage space, a generous cooking area, and other amenities that you will love. Remember, there may be times when the weather may not be the best. That means spending time inside… with the kids… so be prepared! You will need a place to store plenty of games, toys, books, crafts, etc. to keep the kids occupied. Having a second entertainment center comes in handy too! The bunkhouse allows the kids to have their own space. We think there are some great features available in the Crossroads RV Zinger that really work well to make camping experience with kids hassle free. There are two travel trailers we recommend for camping with kids. They are the Crossroads RV Zinger Travel Trailer Models 328SB and the 331BH. Both of these models have great floor plans with conveniences that will make camping with kids so much easier! We have both of these models available on our lot for you to see in person. Both of these features a bunkhouse, one to one-and-a-half baths, and a bathroom accessible from the outside. This provides easy access and makes for quick cleanups, without having to walk through the main living area. What a great feature for camping with young children, and especially when camping at the beach! Both of these travel trailers sleeps up to six and the bunkhouse for the kids has a wardrobe and entertainment center with easy access to the bathroom. There is another entertainment center in the main cabin with AM/FM Stereo w/ Bluetooth. And everyone will enjoy the electric fireplace on those cool evenings or rainy days. Other features include an 81″ interior ceiling height, totally enclosed and heated underbelly with forced heat, and the 331BH has a beautiful kitchen island with a 60/40 sink and lots of storage underneath. Take a look at a complete list of models, floor plans, and specifications for the Crossroads RV Zinger here, or contact Michael Moutzalias at 302-927-0541 for more information. You can also send us an email and let us know if you are looking for something specific. We would love to help you find the perfect camper for your family! Take a look at these stunning interior photos of the Zinger 328SB.